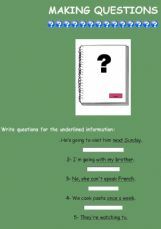 Ss have to make questions for the information provided (15 sentences). Tenses: present simple, pres.continuous, past simple, going to. Useful. Thank you for sharing.